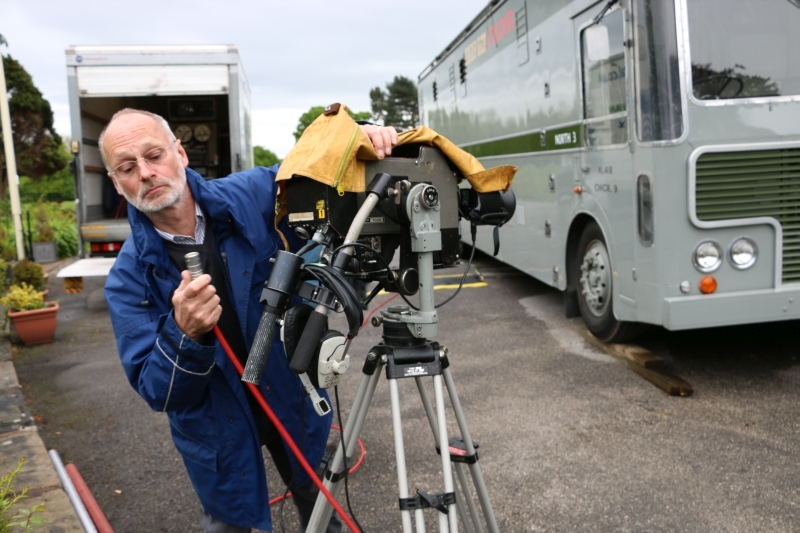 Outside broadcast camera operator Robin Sutherland rigging an Ikegami electronic television camera during an ADAPT simulation in May 2016. Photo: Nick Gilbey. Having developed an interest in lighting and cameras in his youth, Robin Sutherland applied for a BBC job in 1965 after seeing an advertisement in the Daily Telegraph. The following year, Robin began his career at the BBC a trainee technical operator. After a three month course at the Wood Norton training centre, his first role was in studios as the junior member of a studio a crew. “Be in at the beginning”. 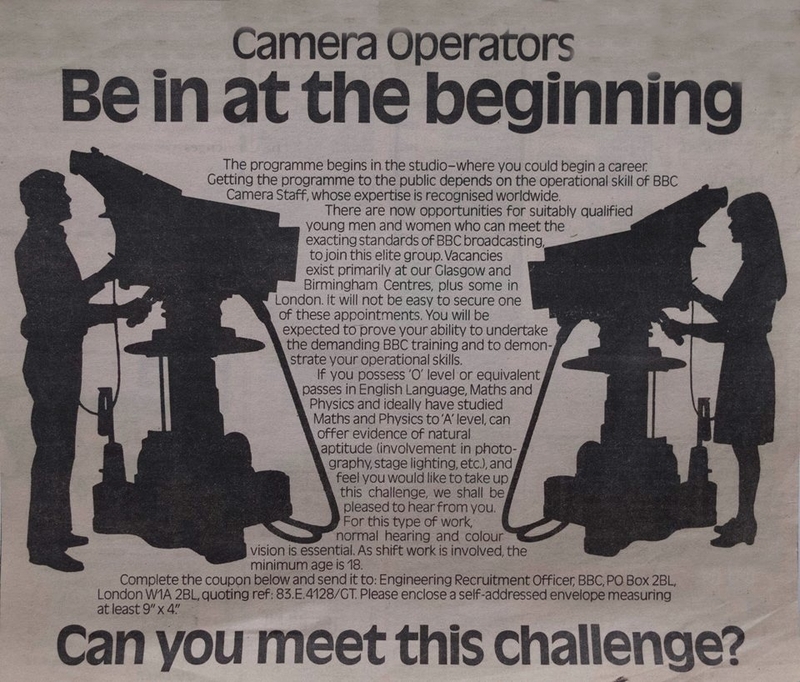 The advertisement for BBC camera operators which caught Robin Sutherland’s eye. 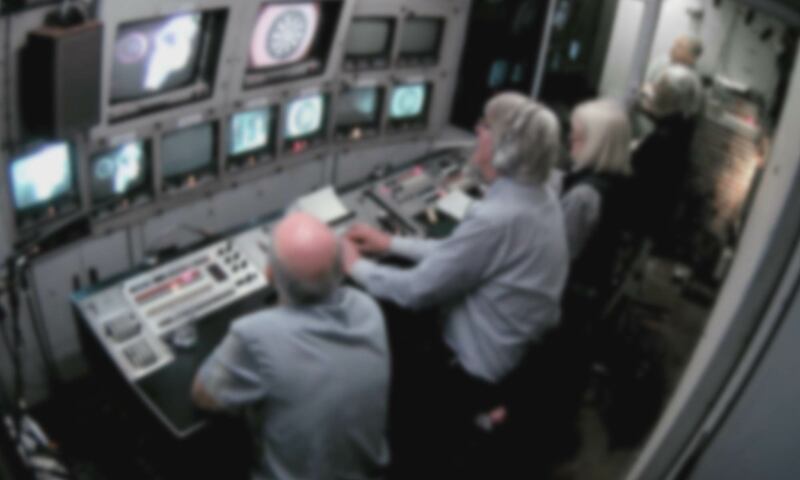 Robin’s first outside broadcast assigment, in August of 1969, was produced using black and white equipment, because the BBC had not fully converted to colour equipment. By 1970 the switch over to Type 2 colour outside broadcast trucks was complete and Robin was attached to one of the London-based Type 2 colour mobile control rooms. In these trucks, EMI 2001 cameras soon replaced existing Pye models, and Robin can remember unboxing some of the first 2001s to arrive at outside broadcasts. These cameras were smaller than previous models as the lens was inside the body of the camera. This allowed camera operators to experiment with new placements and positioning on shoot and made them less cumbersome out on location. Nonetheless, operating the EMI 2001 was a highly skilled and labour intensive job not only during operation but also in setup and preparation. Cameras of this era required significant time to warm up, and operators had to work with engineers in the truck to go complete the crucial task of ‘lining up’. Throughout his career, Robin worked on a wide range of programmes including coverage of the Queen’s Silver Jubilee, numerous general elections, and countless sporting events including supervising Centre Court at Wimbledon, three summer Olympics, and London Marathons providing footage from the back of a motorcycle. One of Robin’s most memorable moments came in the winter of 1982 shooting North Face (1982), the first ever live coverage of a winter ice climb on Ben Nevis. Enduring sub-zero temperatures, the crew used helicopters and sleds to cover the teams of expert climbers. The crew and climbers were eventually forced to abandon their work as the weather worsened and winds reached over 100mph. Throughout his career, Robin has operated cameras from helicopters, hot air balloons, and snowmobiles. Robin left the BBC in 2006 after a 37 year career on the road with outside broadcasts. He continued to work as a freelance camera supervisor until December of 2016 when he eventually retired.